Well the name Holloway comes from the anglo-saxon word which literally means ‘sunken road’, and they date from at least 300 years ago, many going back as far as the iron age. They started life as either drove trails used to move cattle and other animals from farms to markets, routes from inland to the sea ports, pilgrimage routes, or simply boundary ditches. I am not sure whether the term Holloway would have been applied much when the usage of these ‘highways’ was at its peak – I suspect they might well have been referred to as simply ‘lanes’. Holloway, as a name, seems to have come much more to the fore in recent years having been popularised by Dan Richards’ and Robert Macfarlane’s book of the same name. In terms of literature, they also feature strongly in Geoffrey Household’s book Rogue Male, where the main character fleeing his pursuers goes to ground and hides out in a disused Dorset Holloway. They certainly wouldn’t have started their lives as Holloways because most would have initially been at ground level but centuries of use by cattle, carts and people gradually eroded the soft surface creating a ditch which was then deepened and widened by yet more ‘traffic’ and also by water running off the surrounding land as the ditch became at times a river. Eventually, many have become as deep as 20 or 30 feet creating in effect gorges rather than paths. 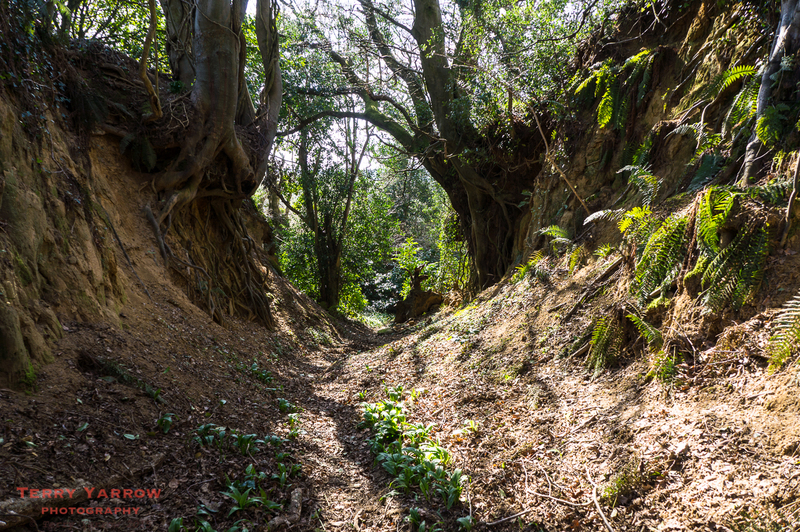 Holloways, and indeed all the ancient byways, are a record of the habits of our ancestors with hundreds of years of repeated use and that makes them rich in heritage and mystery……which is why I love walking them. With walls towering on either side and trees growing out of the top with their network of roots holding the walls in place, these paths have a real air of mystery. You feel like you are walking a natural and secret tunnel as the mesh of intertwined trees and branches above makes you feel shut in. And there is lots of wildlife too! 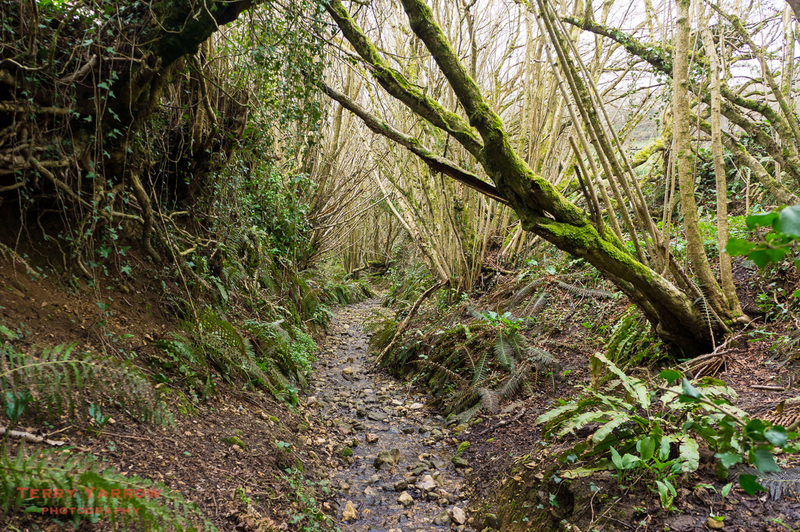 Gilbert White, a pioneering naturalist from the 18th century once said that to walk the holloways was to ‘Access a world of deep history, an unexpectedly wild world, buried amid the familiar and close at hand’. He wasn’t wrong! I have a number of regular walks that take in one or more holloways and they are always a delight to walk. On a grey, stormy day you could almost fear to walk them as the gloom and darkness created by the high walls and overhanging branches creates a feeling of shadowy threat. On a bright sunny day with lovely dappled light filtering through the trees, they take on an altogether different feel! But always secret and mysterious. So where are these Holloways? Well the truth is they are many and varied, ranging from the gorge-like to simply shallow sunken paths, worn by feet, wheels, and hooves. These are a few I have walked. Hell Lane is perhaps one of the most impressive and interesting. With Shutes Lane it connects Symondsbury with North Chideock, climbing up over the ridge near Quarry Hill. 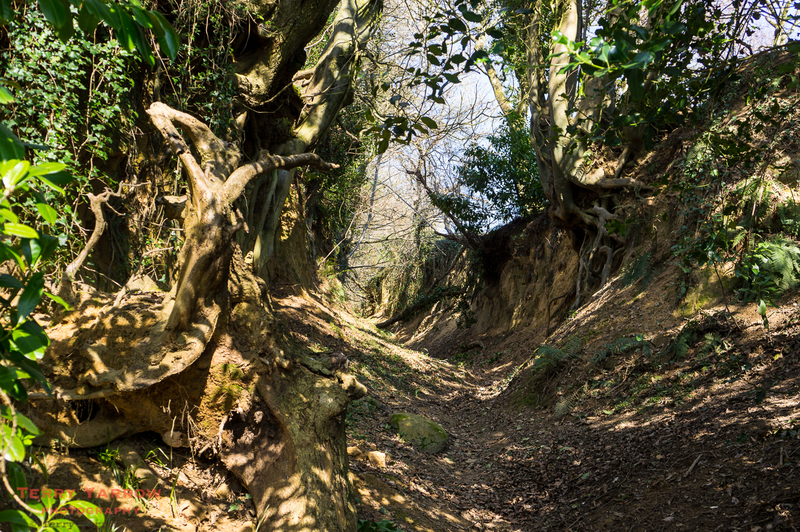 It is interesting because the eastern part is much more gorge like than the western half – to walk from the ridge down to North Chideock is a bit like walking a shallow river bed! The reason for this difference might well be the fact that the church and other buildings at Symondsbury were built with stone from the quarry. You can just imagine how the constant traffic of heavy laden carts running between quarry and village would have considerably deepened that part of the track to the gorge it now is. There are others in this area, tracks such as the one, now part of the Monarch’s Way, that climbs from North Chideock, through the Winneford Valley up over Coppet Hill. And a smaller, but none the less beautiful, path that runs across the ridge at Henwood Hill. 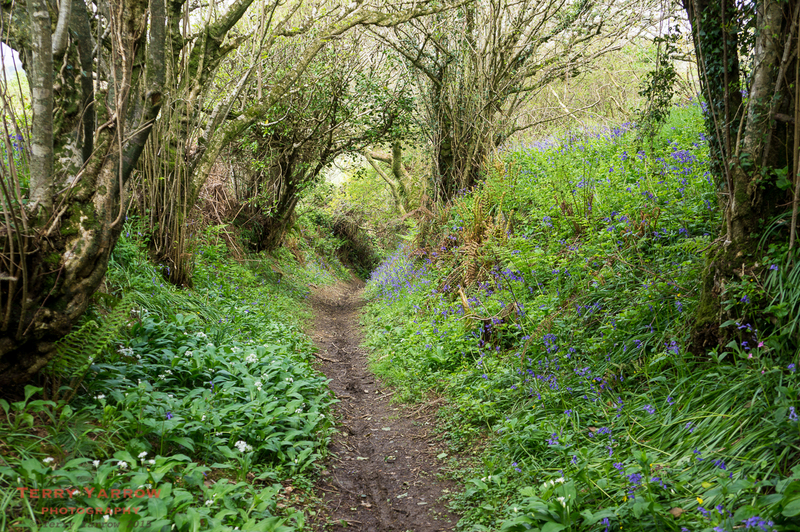 This is a lovely path to walk in spring when the bluebells and wild garlic are in flower. 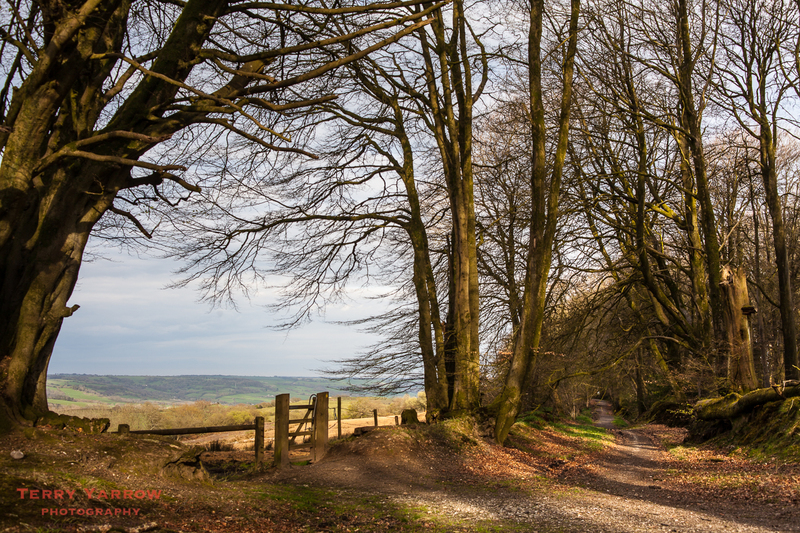 Moving away from this immediate area, there is a fine Holloway that climbs from the A3066 south of Beaminster up over Coombe Down. This is deep and wild with gnarled tree roots growing out of the steep sided walls, holding them in place. It is a well walked path, forming part of The Jubilee Trail. Another smaller lane (or is it a river!) runs from the road at South Poorton and drops down to the nature reserve. With it’s fern lined walls and it’s stony, waterlogged bottom, this is a lovely haven for wildlife and this, together with the nature reserve beyond, makes a delightful walk. And there is evidence of further Holloways at the other end of the nature reserve as the track drops down to another interesting village, West Milton. One further path that I feel is worthy of inclusion is Lewesdon Hill Lane, although this is not perhaps a Holloway in the true sense. I include it because it is ancient and sunken and a beautiful track to walk – it has even been suggested by some to have been part of the Ickneild Way, that ancient super-highway. With moss covered banks on either side and surrounded by ancient woodlands, there are some wonderful views from this path. If you walk Lewesdon Hill Lane, you may well eventually reach the track that drops from the ridge down to the delightful village of Stoke Abbot. It really is worth walking this part as the deeply cut access road that leads to the village is a Holloway in itself, and of course the village with its pub is a pleasant detour. Sadly, not all of our old sunken byways have been well maintained and with the development of other forms of transport many have fallen into disrepair. The pictures above show sunken paths at Cutty Stubbs and Chetnole – both are now impassable. At Cutty Stubbs, I couldn’t even find the entrance to the sunken path and had to ask the farmer for permission to cross his field to find it! I did once question this with the authorities in an effort to have them cleared and reopened but sadly they ‘fall between stools’ and no-one has a budget that they wish to apply. The reason is that these are often Byways Open to All Transport (BOAT’s) rather than footpaths and responsibility for these falls with the Highways authority. The Footpaths authorities have a budget to maintain footpaths and Highways have a budget to maintain roads and BOAT’s………but naturally their funding is always exhausted keeping the roads in reasonable repair, with nothing left for our ‘off-road’ tracks. Holloways may have been popularised by more recent writings but justifiably so. They are ever changing, ever different, ever mysterious, but always delightful! And as is often the case when I walk, I travel along them wondering about those who have trod that way before – were they early drovers, were they pilgrims heading for one of the Dorset abbeys, were they smugglers, were they just ordinary people making their way to the port perhaps to emigrate to other lands! Who were they and what was their purpose in travelling these ancient routes? If only the walls could speak! These days walkers and wildlife are the companions of the Holloway and to go there is to enter another world. Previous What Might Have Been! but this domain name seems to be up for sale! Sorry I’d forgotten that link was still on there. I deleted yarrowphotography some time ago as I don’t really market my pictures. I tend to focus more on my blog. Thanks for pointing it out, I will remove it. They are not just in West Dorset – we have plenty here in Milton Abbas – perhaps not quite so ‘sunken’ as others. That’s true. I think I did say in my blog entry that they are everywhere but that West Dorset is a good place to see them because of its soft rock. Hi Terry, Very interesting reading and enjoyed seeing the pictures of the holloways you have walked. There is one off Dolman’s Hill, very interesting because there are badger sets on both sides with well worn pathways along the banks made by the badgers. Thanks Linda. I’ll have to explore that one as I can’t recall it. Thanks Stephen. Have a great walking holiday in Dorset. Hi Terry, this is fascinating. Do you know of any in Purbeck? Off the top of my head, I don’t Becky. They feature in West Dorset because the stone is so soft. (Sorry, that’s a very long URL!). I’ve never heard anyone else mention them, though. Hmm, that’s interesting. Still can’t say that I am aware of any – although thinking about it, maybe the footpath from the top road (Swanage to Kingston) through to Worth Matravers might count as one. I always though it was just a path between hills though rather than a holloway. There is a small section called Dark Lane at the western end of the hamlet of Shitterton in Bere Regis. It used to be the main route to Dorchester. Unfortunately it is now a little overgrown as there is a new path up to Black Hill that runs parallel to it. Thank you for the mention. Glad you enjoyed my blog. Holloway’s are a fascinating subject. 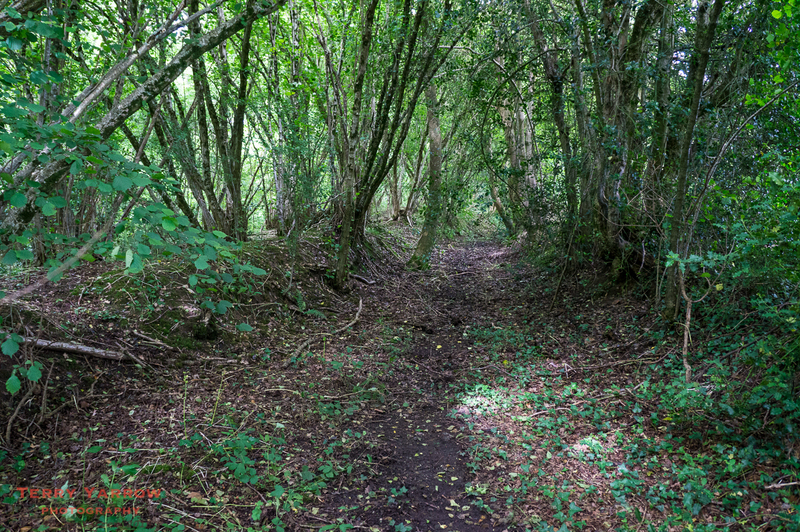 Found this piece after searching on Hells Lane – excellent piece, will definitely be seeking out some of these paths when next in Dorset, so many thanks. There’s something about a Holloway/sunken track that not only instantly transports you back in time, but links you to the earth in a way other paths can’t. Thanks Jim, its great to receive your feedback. 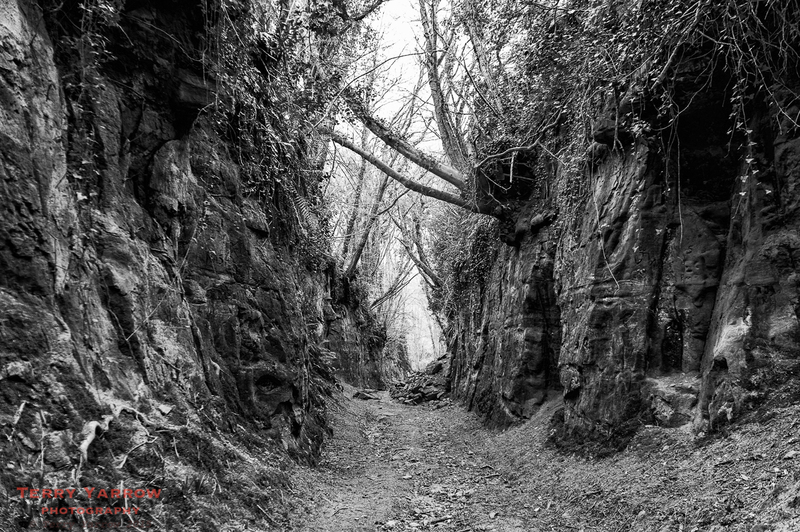 Yes, there is definitely something about Holloways and in fact all ancient paths that grabs the attention. I wonder if these holloways coincide with any parish boundary. In Milton Abbas our parish boundaries often feature a central pathway flanked by a double band and ditch, each ban topped with formerly coppiced trees. There are many boundary ditches known as cross dykes but I am not aware that these necessarily became holloways although some might have. It is true though that often the ancient paths had trees planted on either side, marking their route. Really interesting blog. Do you happen to know who Dinah’s Hollow is named after? Thank you. That’s a good question but unfortunately I have never been able to find the answer, sorry. You appear to have used a number of my pictures in your blog entry although I don’t recall your having sought my permission. Whilst I appreciate the credit, it is normally courteous to seek permission first since the pictures are copyrighted. If you did contact me and I have forgotten, then I apologise. I apologise in advance if I sound ignorant, as I am in another country… Are there any historic preservation societies in that area? The Holloways seem of incredible anthropological value. I wonder what small items have been dropped or forgotten along those ways over centuries of use, what those items might tell us about those who have walked them before us, how we’ve changed over time. I would think at least a University would find that sufficiently interesting and would create an interest in discovering and preserving such a part of human history. An excellent blog and some lovely images to accompany your words. I came across this entry when searching for more information about ‘Holloways’ after reading Robert MacFarlanes book – The Wild Places. My wife and I are regular visitors to Dorset so we are looking forward to exploring Hell Lane. Thank you. Thank you 🙂 I am sure you will enjoy Hell Lane and Shutes Lane when you come, and of course there is Venn Lane as well (that’s the one I think Robert MacFarlane visited in his book ‘Holloway’). Thank you for the additional information. I have not read Holloway just the one chapter on Holloways in The Wild Places. I thoroughly enjoy his writing as well those of his great friend Roger Deakin who sadly passed away. I am looking forward to discovering more of Dorset with help from your blog. Thanks again. Hi John. Thanks for this. I know Dinah’s Hollow and Semley Hollow well. Will have a look at the others. Thanks for your input.